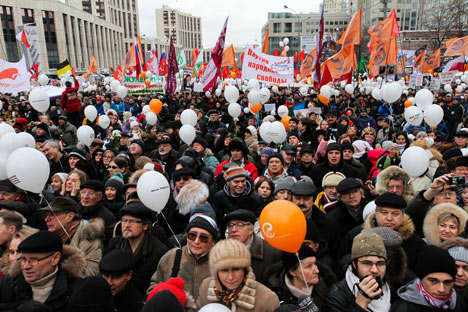 The mass rally on Saturday, that brought tens of thousands of Muscovites onto the streets for the second time in two weeks, marks a new step in the open-ended development of the political situation in Russia, experts said. The protest activity is not slowing down, as skeptics had predicted, and new strong figures such as the former Finance Minister Alexei Kudrin come on board. Prime Minister Vladimir Putin is increasingly the target of popular fury, but the eclectic opposition continues to lack a figure that could emerge as a new national leader. If Saturday’s rally had amassed less people than the numbers on Bolotnaya Square on December 10, it would have meant that the outbreak of protest was a short emotional reaction to the mass allegations of fraud during parliamentary elections on December 4. However, the colorful and overwhelmingly calm crowd that covered most of the broad Sakharov Avenue in east central Moscow and numbering, according to RIA Novosti estimates, more than 55 thousand people, defied the skeptical voices, proving that public politics are back for an extended period of time. The Kremlin is sending signals that it is listening to the protesters. Just two days after the outgoing President Dmitry Medvedev offered a program of political reform in his address to the parliament, the Kremlin spokeswoman Natalya Timakova said Saturday that proposals put forth by Medvedev to loosen restrictions on political parties could in theory be put into action quickly. However, references to Medvedev’s proposals were ridiculed at the rally both by the speakers and ordinary participants. The main target of the ridicule and protest, however, was Putin. No slogan was picked up by the protesters with greater enthusiasm than “Russia without Putin.” In a way, while the December 10 rally at the Bolotnaya Square was a post-Duma election rally, the protest on Saturday, although it repeated the demands for resignation of the Electoral Commission chief Vladimir Churov and a new parliamentary vote, clearly belonged to the presidential campaign. “We are now within the presidential electoral campaign, and the rally at the Sakharov Avenue was undoubtedly a rally under the slogan “Putin leave!” -- said Alexander Morozov, political analyst and chief editor of the Russky Zhural online magazine. Alexei Mukhin, director of the Center for Politial Information think tank, agreed that Putin is increasingly the target but stressed that the opposition continues to lack a comparable leader figure. Mukhin also said that the Kremlin is likely to continue taking over the opposition’s slogans, as it had done in Medvedev’s address. Saturday’s rally also signaled upcoming changes in the leadership structure of the opposition. Perhaps the biggest novelty was the appearance of Alexei Kudrin, the former finance minister, whom Putin refers to as his “friend” remaining “part of the team.” At the rally, Kudrin called for “able leadership” and for the creation of a platform for dialogue between the opposition and the Kremlin. “Otherwise there will be revolution, otherwise we lose the opportunity before us today for the peaceful transformation and the trust that is necessary for a new leadership that will be elected," he said at the rally. For Morozov, Kudrin’s appearance is the main news on Saturday. “Kudrin is a figure who can claim leadership, together with the others,” the analyst said. Petrov said that apart from Kudrin and billionaire and potential presidential candidate Mikhail Prokhorov, other “celebrities” such as the television anchor and socialite Ksenia Sobchak are joining the ranks or protest movement in a sign of its growing appeal, a process that is likely to continue. “If originally [the opponents of the protests] used to say that it is the office lemmings or bored youth that go to the rallies, it is now evident that that it’s not the case,” Petrov said.